Before you ever even heard of a Labradoodle, you probably devised a few creature amalgamations of your own as a kid, via a classic flip book or set of blocks featuring assorted animals you could combine on a whim. Twisty Critters Blocks are a modern twist on a classic toy — a clever concoction of wooden blocks from Switzerland that let kids mix and match animals including a bear, rooster, penguin and cat to invent new critters such as a catenguin or a broostercat. Just make sure by the time your little one starts school that he’s aware there’s no such thing as a bearcatooster. Before you ever even heard of a Labradoodle, you probably devised a few creature amalgamations of your own as a kid, via a classic flip book or set of blocks featuring assorted animals you could combine on a whim. 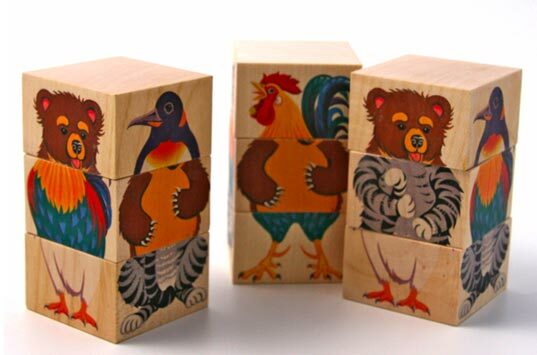 Twisty Critters Blocks are a modern twist on a classic toy -- a clever concoction of wooden blocks from Switzerland that let kids mix and match animals including a bear, rooster, penguin and cat to invent new critters such as a catenguin or a broostercat. Just make sure by the time your little one starts school that he's aware there's no such thing as a bearcatooster.